The co-pilot Andreas Lubitz who steered an airline with 150 people on board into a French mountainside had been dumped by his girlfriend the day prior to the crash and was undergoing treatment for depression from a doctor, according to reports Saturday. If I’m still around in 40 years, and if Western Civilization still exists in a recognizable form — both BIG ifs at this point — I’ll have a tough time explaining the Media Guessing Game to my grandkids. All evidence indicates that the copilot of Airbus machine in his six-months break during his training as a pilot in Germanwings, converted to Islam and subsequently either by the order of “radical”, ie. devout Muslims , or received the order from the book of terror, the Quran, on his own accord decided to carry out this mass murder. As a radical mosque in Bremen is in the center of the investigation, in which the convert was staying often, it can be assumed that he – as Mohammed Atta, in the attack against New York – received his instructions directly from the immediate vicinity of the mosque. But as Vox notes, that’s vague and sensationalistic, and nobody hears him yelling “Allahu Akbar!” on the tapes that have been released so far. On the other hand, this kind of thing is awfully consistent with Sudden Onset Jihad Syndrome. On the other other hand, the Left and the media (BIRM) didn’t immediately start screaming “this has nothing to do with Islam!”, which is — so far– the surest tell that something is in fact all about Islam. So maybe he’s not a Muzzie after all. On the other other other hand (please allow me four hands for rhetorical convenience), the Left and the media (BIRM) also haven’t started screeching about misogyny, which — as Vox notes here — is the likeliest non-Islamic scenario. If this guy were an airborne Eliot Rodger, you’d think we’d have heard about it by now. So score one in the “probably is a Muzzie” column. Of course, a third possibility exists — maybe he’s just a random, non-ideological psycho. Alas, he’s German, so our completely objective, totally nonpartisan media is no help there. Had he been American, of course, MSNBC would’ve called him a Tea Partier before the debris stopped falling. At which point the usual rules would apply — if he ever complained about his taxes, he’d be Republican now and forever; if the words “Tea Party” suddenly disappeared down the memory hole, it would soon be revealed (on conservative blogs, nowhere else) that he was a card-carrying member of Communist Party USA. So, yeah, kids… can you believe it? In Grandpa’s day, you had to attack each and every “news” story like a deranged, coked-out archaeologist, jackhammering through seventeen layers of bias to finally figure out some rough approximation of the truth. Because Our Betters in the media considered it their sacred duty to decide what us proles should and should not hear about events out in the world. And that’s why your Granddad has been an alcoholic since 2008….. This entry was posted in Uncategorized on March 27, 2015 by Severian. I’ve pretty much said all I can say about academia. But sometimes another’s words are too good not to share. …The most terrifying statement for a Gamma is admitting he is wrong about something. RTWT. Learn to dress up your Gamma Delusion Bubble in 50-cent words, and you’re 90% of the way to a PhD in the humanity of your choice. This entry was posted in Explaining Academia on March 24, 2015 by Severian. Education is a human right. Share if you agree. So this came across my desktop yesterday. Oh yeah. It’s free. *If* you’re accepted. And that’s a big IF. Even in Europe, you have to be put in an academic track school by about age 12 to hope to make it in to one of these colleges. Since this “Free in Finland” word has gotten out, Finland has had to clarify that while tuition is free, you have to pay your own way for room and board. And hey, if education is a right, aren’t food and shelter yet more basic rights? 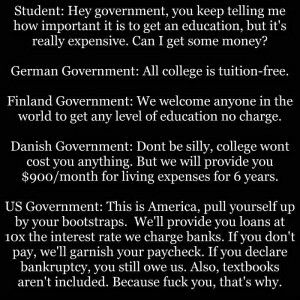 Why does Finland HATE students????! “Finland Starves Students – Leaves Them in the Cold!” That would be the community organizing headline from the Chicago school of politics. 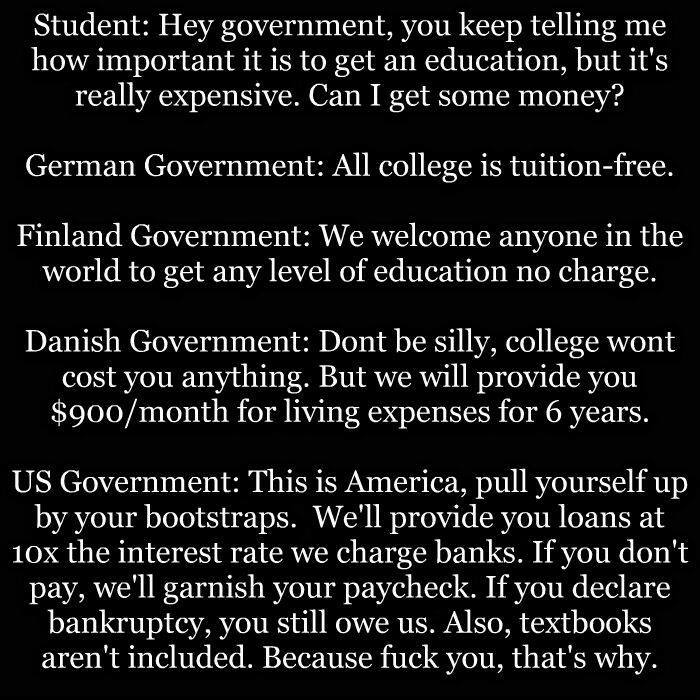 All colleges in Germany have had “free” tuition since way way back in … October. Jury’s probably still out on how sustainable it is, or the effect it will have on the quality of education you can get. As it stands, America pretty much has a headlock on top universities in the world so maybe there’s something to this not-so-public approach. I think the main difference between America and elsewhere has been that your education was something you were expected to get — so much so that state charters mandated that a certain size plot of land in every township be set aside for a school which would be funded by the community. But the attitude was that an education isn’t something that is given to you or provided to you — since we as a people have required that you get one from the beginning, we’ve considered it a duty of society to provide the opportunity – up to a point. I’d argue that we don’t have to provide you an opportunity for a degree in “Gender Studies”. It’s not “your” car anyway, because you didn’t build that. This provision of opportunity is there with the expectation that you will be obligated, if physically and mentally able, to go out and pull your own weight when it is said and done – and perhaps if you do well enough create something that will help others pull theirs. But to the people at “US Uncut”, it’s about “rights”, not “obligations”. 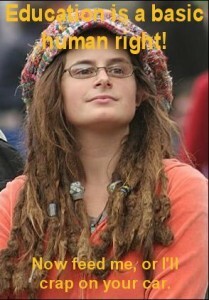 “Rights” mean somebody OWEs *me*. “Obligations” are for chumps. Now feed me or I’ll cr*p on your car. It’s not really “your” car, anyway, because you didn’t build that. Oppressor! We do have an over-emphasis on a college degree as a credential in our society. College is fine — you can get a great education if you want one, and you can get lots of financial help getting one if you need it and show an aptitude for it. And I think there is something to a Financial/Education complex where they rub each others’ backs. Universities cost 5x more than they did in 1985, but inflation has “only” cut they buying power of a dollar in half. I think Universities charge more because they can get it, and banks make the loans because they can make money off the interest. Kind of like what health insurance did to health care costs. The whole “10x what ‘they’ charge banks” thing is just emotionally charged rhetoric that takes advantage of, as someone once put it, “the stupidity of the American voter”. Any amount banks get charged for loans to them is ultimately passed on to the consumer, and student loan rates aren’t out of line with most other loan rates. I think Mike Rowe & his Mike Rowe Works is on to something. Degrees are overrated, and inflated – in grades, cost, and subject matter. There is lots of honorable, even decent-paying work out there that does not require a college degree, and it’s work that needs doing. This entry was posted in 39.2% of Statistics Are Made Up, Chestnut of the Week, Leftist Unreality, Life is Not a Bumper Sticker, Uncategorized on March 9, 2015 by philmon. I like the cut of Kurt Schlichter’s jib. Understand that the purpose of modern American “education” is not to educate students. It is primarily to provide cushy, subsidized sinecures for liberal administrators and faculty while, secondarily, providing a forum to indoctrinate soft young minds in the liberal fetishes du jour. Actually educating students is hard, and a meaningful education is anathema to liberalism. In the liberals’ ideal world, the universities would simply fester with leftist nonsense and not even bother with trying to teach their charges anything at all. And today, it’s pretty close to being the liberals’ ideal world. N.b. to our three regular readers. : The writer is conservative pundit Kurt Schlichter, not the Weimar Republic’s penultimate Chancellor, Kurt von Schliecher. Since, you know, it’s me posting this. This entry was posted in Explaining Academia on March 5, 2015 by Severian. Remember the Tucson Massacre of 2011: Because the shooting targeted a Democrat congresswoman, it was instantly assumed by the media that Jared Loughner must be a right-winger. It turned out, however, that Loughner was a psychotic who had become obsessed with a left-wing 9/11 “Truther” video called Zeitgeist. Because I spent several days researching the Zeitgeist phenomenon in the wake of the Tucson Massacre, I can assure you that this would have been a fascinating subject for the New York Times or one of the major networks to do an in-depth report about. However, once it became clear that Loughner was not a right-winger, liberals instantly lost interest in his motive and there was never any real media follow-up on Loughner’s Zeitgeist obsession. McCain says the media “lost interest” in Loughner’s motives because of their biases. But it was much worse than that — they lied about him first, and so extensively that I have liberal friends who to this very day insist Loughner was a right winger. McCain’s point — which is right, and sensible, and just — is that we should call these freaks what they are: Moody loners, Creepy Little Weirdos, psychos. We should leave the politics out of it, because crazy gonna crazy, and the particular form it takes is usually random. I’ve said as much myself — if The Bad News Bears had been playing instead of Taxi Driver when John Hinckley went to the movies, his psychopathy would’ve manifested in some other, totally different way… but he still would’ve been a murderous psycho. This is an honorable thing, as I say, and if we lived in an honorable world it would be good and sufficient. But we don’t. The media is going to politicize these things for all they’re worth, because the media are Cultural Marxists to a man. That’s what they do — that’s all they do — and if they can’t just bury it, as they do with even the most horrific black-on-white crimes, they will spin it into irrelevance (as with Hicks), or outright lie about it (Loughner). Turnabout is fair play. Let’ make those fuckers play some defense for once. *McCain says Katz has “commendably done more reporting;” I assume McCain’s tongue is so far in his cheek that it’s coming out his left ear. This entry was posted in Uncategorized on March 4, 2015 by Severian.